Enjoy the loudest weekend in Ostrava! The combo tickets for LIR On Tour and Devastator Hall are out now! Two parties, one place. 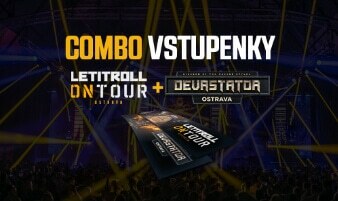 Let It Roll On Tour and Devastator will bring the loudest parties to Ostrava. Friday night will be full of the hardest music that will be lead by N-Vitral, Act of Rage, Floxytek and Sirio. On Saturday, you will portal to another dimension full of the best of drum and bass with A.M.C, Hybrid Minds, René Lavice, Gydra, and so much more. Lose yourself in the unique vibe of the industrial location of Trojhalí Karolína and enjoy the two parties that you won’t be able to forget.